The hospital where my daughter spends her days is one of the best in the country; a place of comfort and cheer, where cutting-edge medicine is served side by side with gentleness and joy, and mental wellness is considered a vital partner to physical health. Evidence of this is everywhere: The rooms we live in in shifts these days are bright and big, friendly and comforting, with equal access and support for patients and their families; child life specialists and kind social workers are core members of the medical teams that visit throughout the day; clowns, therapy dogs, craft-makers and musicians visit the wards regularly, and those who can move more freely throughout the hospital find a seemingly endless unfolding of spaces both large and small, staffed with volunteers and paid professionals eager to offer play, shared solace, and performance on a busy schedule aimed at filling the empty hours of those who need it most. In the middle of this labyrinth of hallways lined with cheerful art and playful design lies Prouty Garden, a green, welcoming space that serves as the perfect symbol for the creative balance of soul and body we have experienced in the last few years as we come to frequent this sacred place. Designed by the same architects that built Boston’s Fresh Pond and New Orleans’ Audubon Park, the half-acre is subdivided into smaller shady spaces and open lawn, broken up by benches and fountains, rich with hidden statuary and small niches that offer privacy to those still struggling to accept the changes wrought by medicine, disease, and injury upon their fragile bones and flesh. For kids whose only other access to the outside world is far too often nothing more than a half-glimpsed skyline through an upper story window, Prouty Garden is a haven in the midst of hell – the only space large enough to guarantee sunlight throughout the day to kids whose skin has grown pale from lack of exposure, and the only way to truly let them feel like they are outside, in a fully open space, surrounded by nature, with sky above and grass below. We’ve chased squirrels and rabbits there, and hunted for eggs on two successive Easters. We’ve walked there with grandparents and friends who seem too sad to truly be themselves in hospital rooms full of medical devices and the other trappings of illness. In many ways, the garden is ours; in many ways, it is needful, as much a part of the lives of my children as the doctors and nurses that populate their days. But this, too, must pass. As of this year, Prouty Garden is slated to be torn down, to make room for a new building that would alleviate current strain on space in the hospital – a strain we know well, having stayed overnight in the ER at least once while we wait for a bed to open up upstairs. And although public outcry, especially from those children and families who have been served directly by the garden, is loud and clear, ultimately, the hospital trustees continue to maintain that the destruction of our beloved garden is the best path forward for all of us. Sadly but unsurprisingly, the controversy over the loss of the garden is already affecting its ability to serve children and their families. This morning I spoke with a father whose kid is here for the long haul, midway through a four-month treatment for cancer; last night when they went down after dark, he said, the security guard treated them with suspicion, and insisted on taking down their badge numbers before letting them in. And so we went down to the garden ourselves, once the elderchild had woken up, and her nightly fever had gone down enough to travel. And found it blocked off, and swarming with security guards, who kindly informed us that until the kind and well-intentioned protesters had left their post at the front of the hospital, the garden would remain closed, just in case. It’s true that Boston Children’s Hospital is in desperate need of more beds. It’s also true that space is dear here on the edge of downtown Boston. 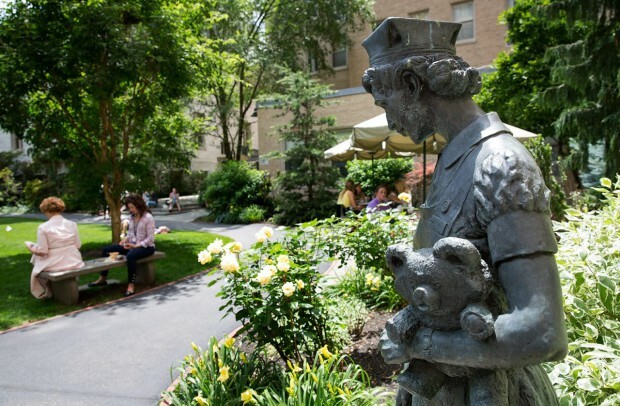 But how ironic, how bittersweet, that a garden designed to be a core component of the healing practice of one of the best hospitals in the country has become, like any other medicine, so carefully meted out, and so cautiously watched. My daughter took being turned away from the garden in stride, as she does so much these days. She knows, like her father, that the time and place for protest of our own must be carefully guarded, and cautiously selected, lest we learn to live in anger at the world. But after the protesters left, we returned and found the garden open again. We sat on a stone bench near the entrance, alongside a statue of a nurse and child dedicated the poet whose bequest still sustains it 60 years after its founding, and ate a late breakfast, throwing our crumbs to the sparrows, which clustered at our feet. The sun was bright, and the daffodils big in bloom. The long lawn was green and full of life, and all around it, small copper and marble statues of foxes and egrets, squirrels and beavers nestled in the flowerbeds and fountains, their noses red and round with evidence that the clowns had been there before us. It was hard to miss the two security guards watching us carefully from the other end of the garden. It was hard not to look at the big Dawn Redwood that loomed above them, and over everything, and think of how much, how very much, we have lost, and will continue to lose to love in this world. But for a moment, there in the sun and dirt, my daughter smiled, and laughed, and felt free again. And after we returned to her room, and the couch in the corner where I will stay the weekend, and leave again on Sunday, I thought of all the garden songs I know, in which the idea of the garden, as metaphor and locus, features predominantly as a place of love, solace, growth, and reconnection to nature. May the wild and cultivated places of our world live in our hearts and minds in our times of trial, that they may serve us in our pain and sorrow. May we too, find them in our world, and wander through them, and be free. Ad-free and artist-friendly since 2007, Cover Lay Down features musings on the modern folkways through the performance of popular song year-round here and on Facebook thanks to the kindness of patrons like you. I like your site. I rarely read the posts on blogs but I did read all of this one. Best wishes to you and your family.